Marcos, 89 and Monica, 87, have been married and living in their apartment in Buenos Aires, Argentina, for 65 years. In 2007, Monica was diagnosed with Alzheimer's disease. Since that moment, her husband devoted all his time to take care of her. 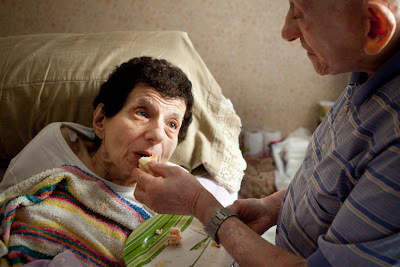 Will you and your partner get old together and still care for each other like this? Will the two of you still be there for each other, when either of you are sick and bedridden? * Photography by Alejandro Kirchuk in Never Let You Go, which documented the old age in one of its conditions, the Alzheimer's disease. Awarded the first prize winner in the category of Daily Life by World Press Photo.